There’s an area of the system that I’m about to make big changes to. I had started off by creating characterization tests as a way of understanding how the current system works while also weaving a safety net that will quickly give me feedback on the effects of my code changes. I have a good suite of tests and was to the point where it would be helpful to me to know what areas of the code are still not exercised by any tests. 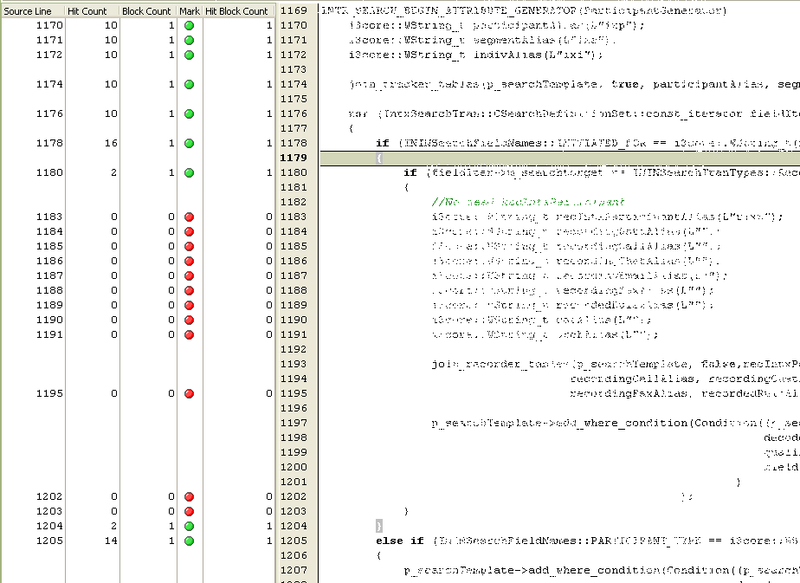 I was hankering for a code coverage tool. 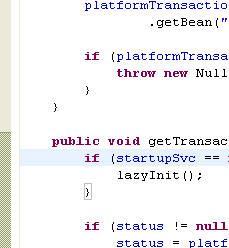 I had tasted the goodness of EclEmma in Java/Eclipse land — “Is there anything available for C++?” I wondered. I resisted stopping to learn a new tool. I worried that support for C++ might be clunkier, less seamless than what I had experienced in Java. I wondered what the company approval process would involve to purchase a license. The tedium and error-proneness of alternative 1 combined with the spectre alternative 2 presented of an extended stabilization time trying to figure out afterwards what my code changes had caused overcame my reluctance, worries, and wonderings. Besides, if I could get a code coverage solution in place, next time I could conceivably just use it, whereas if I do alternative 1 or 2 this time I’ll be faced with this same dilemma next time. OHHHHkay. I was moved to go ahead and try to figure this out. It didn’t turn out nearly so bad as I feared. When I asked around internally I found that as a company we already have some experience with a product called AQTime from a company called AutomatedQA. Having gotten a license, I installed AQTime 6.3.0. 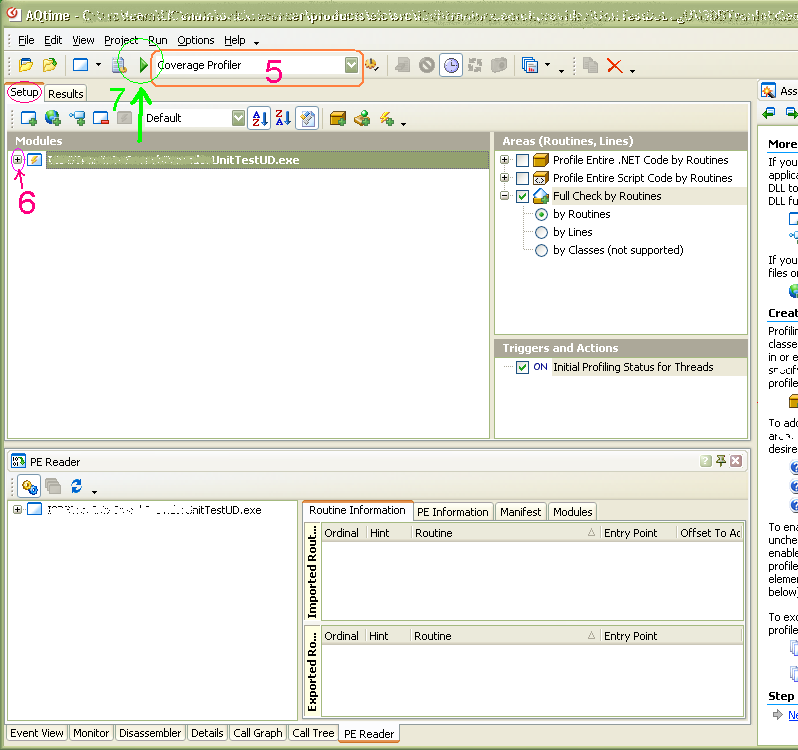 This Editor window provided just what I had envisioned. Now I can quickly see what’s covered, sometimes covered, and not covered. I browsed through, looking for red dots. I knew that my tests were probably not exercising these error logging sections, but this is a good confirmation and reminder to me. Those sections being lower risk, I’m not sure whether I’ll take the time to exercise them all… now I can make a more informed decision. This coverage check quickly showed me five to ten such branches that lack tests. 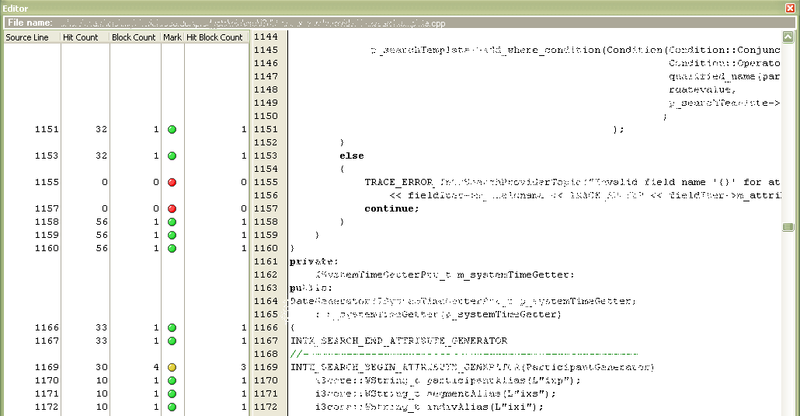 These are areas where if I made changes to the production code, I could too easily miss finding out about the breakage. Good to know about them! And next time I want a test coverage check, I shouldn’t have to go through all the preliminaries. I’m glad to have a coverage checker in place. I found the AQtime application help to be quite…helpful in getting up and running, as I was not familiar with the concept of an “area” or how to get to an editor. 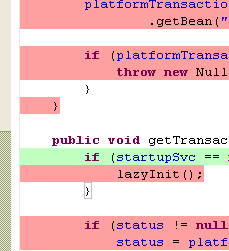 The problem is, now all the code everywhere in my project is red or green, which is distracting! You can cause an individual file’s coverage highlighting to go away by modifying the file… but it’s annoying to have to do that to each file you look at as you browse around your project after a coverage session.